I really love cooking fish for dinner. I’m a big fish fan and it’s generally so much quicker and easier to cook well than meat. It is also lighter and less fatty. However, it’s one of those things I have a limited number of ways to cook in my repertoire. Roast it and serve with veg, pan fry and serve with veg, stir fry, maybe a chowder or fish pie… All of the above are great dinners, I just think there could be so many more ways to have a fish dinner that’s a bit different. 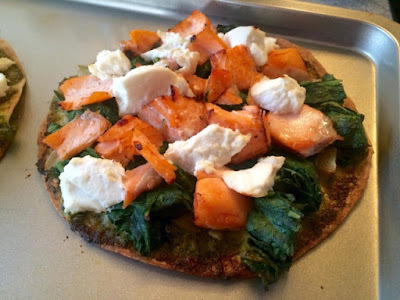 I decided to combine my desire for something different to do with fish with my newfound love for tortilla based pizzas! … Why not? I guess it is a tiny stretch of the imagination to call this a pizza. I used a tortilla base, there’s no tomato sauce and the only cheese in evidence is a soft cheese rather than the usual harder melty varieties used on pizzas. But, it’s round and cut into slices and looks pizza-ish, therefore we’ll be calling it a pizza. 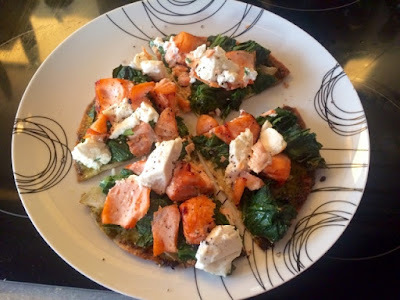 What I love about my tortilla pizzas is that because they’re so much lighter you can have a whole ‘pizza’ to yourself and not feel guilty about it! They’re so quick and easy as well. I’m finding they make great Friday night in, movie time dinners. Much better than a takeaway. 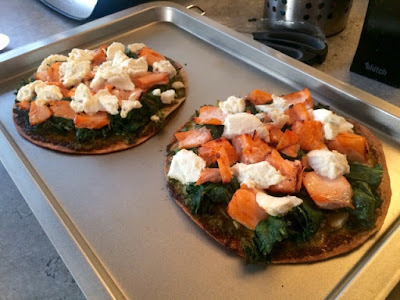 I’d been to visit my parents the weekend before making these and had a huge bag of homegrown goodies to use up, including a mountain of spinach, so I thought that a classic spinach and ricotta combo might go well with the salmon. 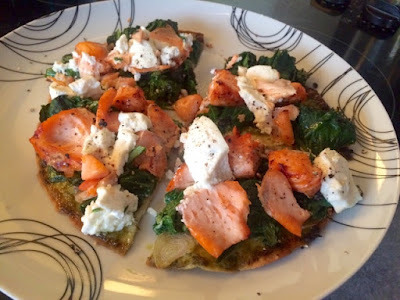 I baked the salmon before using it on the pizzas. 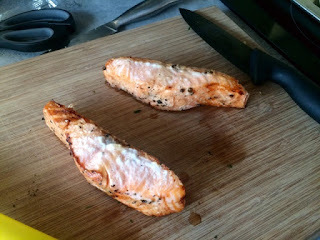 Wrap the salmon in foil, season and bake for 20 mins in a preheated oven at 200ºC or use ready cooked salmon fillets, available in the fish section of most supermarkets. As everything was pretty low calorie piled the toppings high and Hey presto!.. awesome and tasty Friday night pizza! 2. 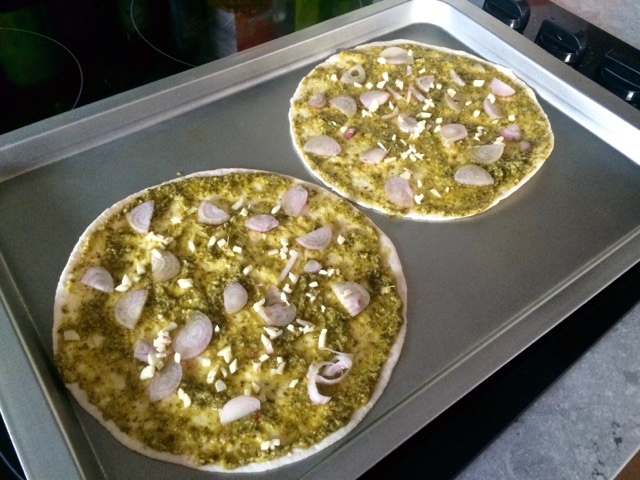 On a baking sheet spread two tortilla wraps with pesto, getting as close to the edges as possible. Sprinkle shallots and garlic over evenly. 3. 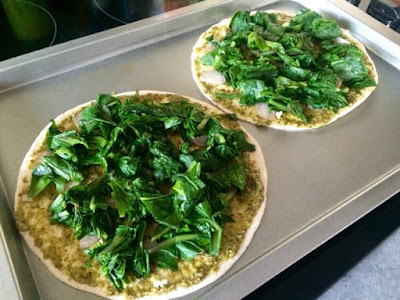 Spread the wilted (and thoroughly drained) spinach over both pizzas. If there’s too much water in your spinach it could soak through to the base and make your pizzas quite soggy. Use a clean tea towel or a lot of kitchen roll to squeeze out all that excess water. 4. 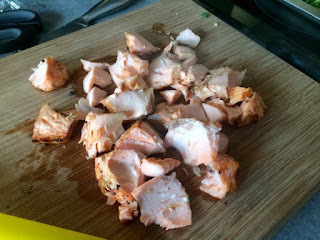 Break the salmon up into flakes. 5. 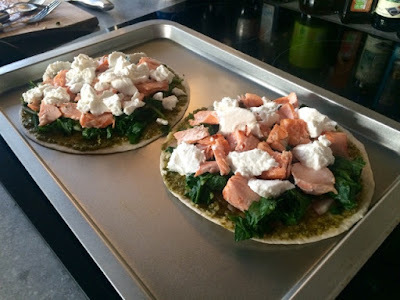 Evenly scatter the salmon on top of the spinach and top with several blobs of ricotta. 6. Bake in the oven for 10 minutes or until the edges of the tortillas have crisped up and browned. 7. Use a pizza cutter to slice into wedges and enjoy with a good movie… and a perhaps a cold beer or a glass of wine to celebrate the end of the week.